Lafayette’s campus on College Hill overlooks the confluence of two major rivers, the mighty Delaware—longest undammed river east of the Mississippi—and the Lehigh, the Delaware’s second-largest tributary. Closer still to the College flows the Bushkill Creek, making its way under the Williams Arts Campus on North Third Street before spilling into the Delaware. The riverine resources are tools teachers use to provide greater experiential learning for students. 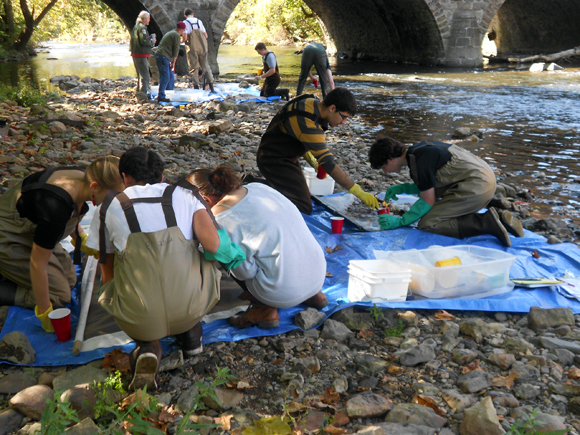 Recently, activities have focused on the potential effects of dam removal, how geologic chemistry reveals pollution in soil and water, what’s in treated wastewater effluents, and how invasive species impact native wildlife. David Brandes, professor of civil and environmental engineering, notes that rivers, canals, and railroads helped Easton become a major commercial center and transportation hub for the steel and coal industries in the 19th century. (Lafayette, in turn, became one of the first American colleges to address the needs of the Industrial Revolution by adding civil and mining engineering to the traditional classical curriculum in 1866.) One effect of industrialization was the erection of dams along the Bushkill Creek to support water-powered mills that helped process grain, lumber, silk, and flax. “Dams can deteriorate water quality, create a deficit of oxygen, slow velocity, and fragment the habitat for wildlife such as trout, instigating a push towards dam removal in Pennsylvania,” says Megan Rothenberger ’02, assistant professor of biology. One of her studies concluded that the quality of the water above a dam on the lower Bushkill had deteriorated; it was murky with arsenic, cadmium, copper, and lead, and therefore detrimental to native macroinvertebrates, an indicator species. One proposed solution was to dredge behind the dam to remove polluted sediments prior to dam removal. 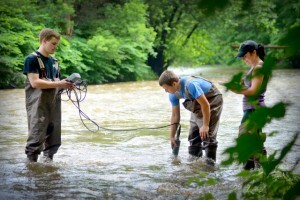 Geology Professor Dru Germanoski works with students on the Bushkill Creek. As a student, Maricate Conlon ’11 worked with Brandes and Germanoski to measure the concentrations of heavy metals in legacy sediment behind the Third Street Dam along the Bushkill. They discovered that the concentration levels wouldn’t pose hazards if they were released. Conlon is among many talented students interested in environmental issues who have been attracted to the College by the opportunities its location provides. She believes the field research she did here contributed to being well-prepared for graduate studies and her career. She majored in geology at Lafayette, earned a master’s degree at Boston College, and is now a geologist with an international environmental consultancy. Brian Schubert ’04, who majored in geology and minored in environmental science, recalls researching with Germanoski how sediments in the Bushkill are transported and how they are affected by land-use practices. 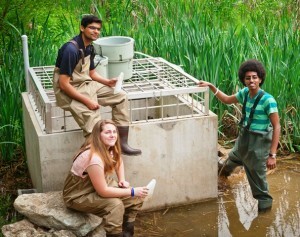 Hassaan Khan ’13, Hannah Griesbach ’13, and Leikune Aragaw ’15 collect water samples and computer data at Sullivan Park to evaluate back in the engineering lab. Field trips to the Delaware Water Gap—where the Delaware spills through an opening in the Kittatiny Ridge, where the mountain-building pressures that crumpled and folded the layers of rock millions of years ago are plainly revealed—were a van ride away. Schubert’s undergraduate research propelled him toward doctoral studies at Binghamton University, to post-doc research at University of Hawaii, to field work in Canada, Ireland, and Alaska, in Death Valley and in Siberia. He’s now on the faculty of the School of Geosciences at University of Louisiana at Lafayette. “My Lafayette experience informs my own teaching,” he says. Working with Brandes, Alec Bernstein ’11 used hydraulic modeling to assess the potential effects of removing a small relic dam along the Bushkill. 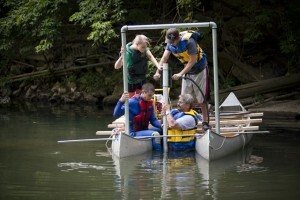 His undergraduate research and work with Lafayette’s chapter of Engineers Without Borders establishing a clean-water system in rural Honduras inspired his passion to work with water resources. A civil engineering graduate, he went on to earn an M.S. in environmental and water resources engineering at University of Massachusetts, Amherst, then worked in Kolkata, India, on a Fulbright Grant, evaluating the sustainability of water and sanitation systems. He’s now a water resources engineer in Seattle. “It all started on Bushkill Creek,” he says. This feature is excerpted from a longer article in the Spring 2015 issue of Lafayette Magazine.